We naturally gravitate toward salads during summer, but it can be hard to turn to a big bowl of raw veggies in winter when it’s freezing out. This vegan caesar salad is the perfect combination of vibrant and comforting–and a great way to devour eat a huge bowl of raw greens without feeling cold! The classic caesar salad is made with tons of non-vegan ingredients which shall remain unnamed, and romaine lettuce; I subbed the romaine with collard greens, which are in season now and so beautifully fresh at my local farmer’s market. 1 cup raw chopped collards has 230% of your daily Vitamin K (bone health), 48% vitamin A (eye and skin health), 23% C (immune system) and 15% folate (keeps your brain sharp and mood high). Topped with crispy oven-baked chickpeas and creamy vegan caesar dressing, it makes for an amazing and gourmet, yet simple and healthy salad! 2. In a medium bowl, combine cumin, coriander, flour, nutritional yeast, and salt together with a fork. Add chickpeas and toss to coat. Add olive oil and coat thoroughly. Spread out on the baking sheet and bake for 15 minutes, turning over once at 10 minutes. 3. In the meantime, prep the collard greens and pat dry with paper towels. 4. In a small bowl, whisk together tahini, water, garlic, capers, fresh thyme leaves, and fresh lemon juice. Adjust seasoning to taste and add freshly ground pepper. 5. Toss the collard greens in half the dressing to coat. 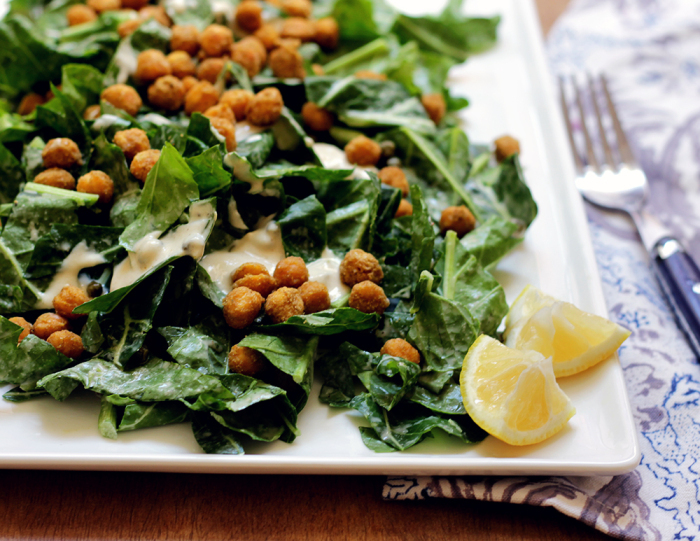 To serve, plate the tossed salad, top with chickpeas, and drizzle with remaining dressing. **These chickpeas are best served hot from the oven!